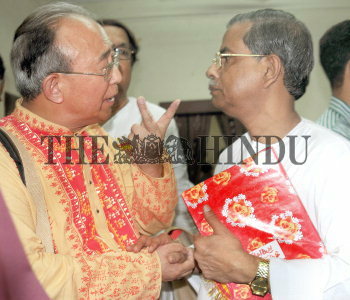 Caption : Kolkata: Dong You Chen (left) and Vice Chancellor of Rabindra Bharati University, Karuna Sadhan Das sharing a lighter moment after the Thirty-fifth Convocation at Jorasanko Thakurbari in Kolkata on Saturday. Mr. Dong has been honoured by the University for his work of translation and editing the Rabindranath Tagore's novel and short stories in Chinese language. STORY: The Thakurbari at Jorasanko located in the northan part of Kolkata, is the ancestral home of the Tagore Family. The Nobel Laureate, Rabindranath Thakur was born and died in this house, which was built in the 18th century by his grandfather Prince Dwarkanath Thakur. The complex has several buildings. The Museum is a major repository of the works of the Tagores, especially of Abanindranath and Rabindranath. The museum offers details about the history of the Tagore family including its involvement with the Bengal Renaissance and the Brahmo Samaj. Song, dance, prayer and remembrance, all will come together on May 9 according to poet?s unique style to start a year-long celebration of 150 years of Rabindranath Takhur. "Where the mind is without fear and the head is held high Where knowledge is free Where the world has not been broken up into fragments By narrow domestic walls Where words come out from the depth of truth Where tireless striving stretches its arms towards perfection Where the clear stream of reason has not lost its way Into the dreary desert sand of dead habit Where the mind is led forward by thee Into ever-widening thought and action Into that heaven of freedom, my Father, let my country awake." These great lines from his famous book ?Gitanjali?, which earned him Nobel prize. Photo: Arunangsu Roy Chowdhury May 07, 2010.